I tried rhassoul clay in my hair once as a treatment and didn't like it. This is different. And I got at least two more days out of my blowout. I once tried rhassoul clay in my hair as a pre-wash treatment on the advice of an acquaintance for whom the ritual was a centuries-old cultural tradition. She had long, shiny and thick waist-length black hair, and swore by the Moroccan clay mask as the key to keeping her healthy, beautiful hair soft, strong and well conditioned. I just swore, in the not-good way. Distributing the clay in my thick hair was tricky enough, but rinsing it out – I hated the experience. Too much like hard work; I prefer simplicity when it comes to beauty stuff. I&apos;m pretty sure I mixed the clay with some water and maybe some kind of oil – olive? I can&apos;t remember now, but many DIY clay hair mask recipes call for ingredients such as coconut, sweet almond, lavender and/or rosemary oils as well as apple cider vinegar. Maybe if I&apos;d googled first.... Anyway, I really disliked the experience so I never repeated it. 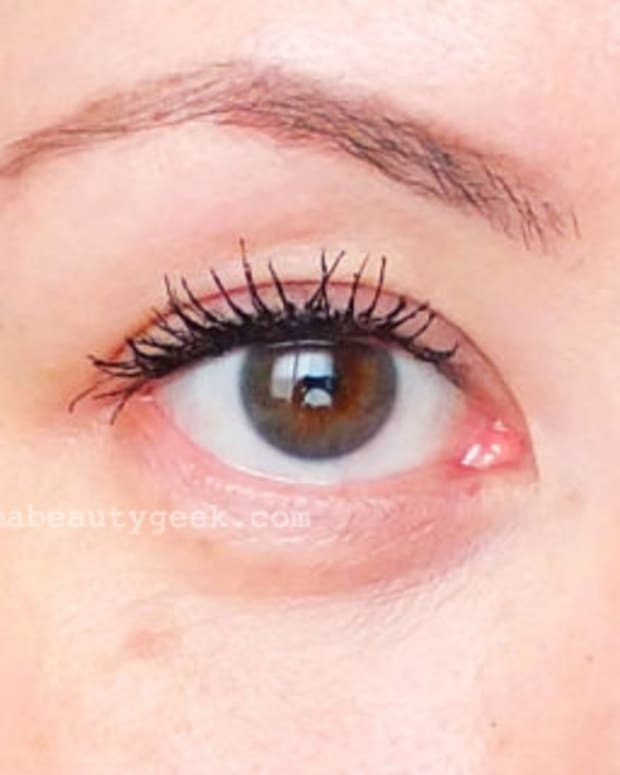 Doesn&apos;t help that I&apos;m really not a DIY-beauty-recipe girl. 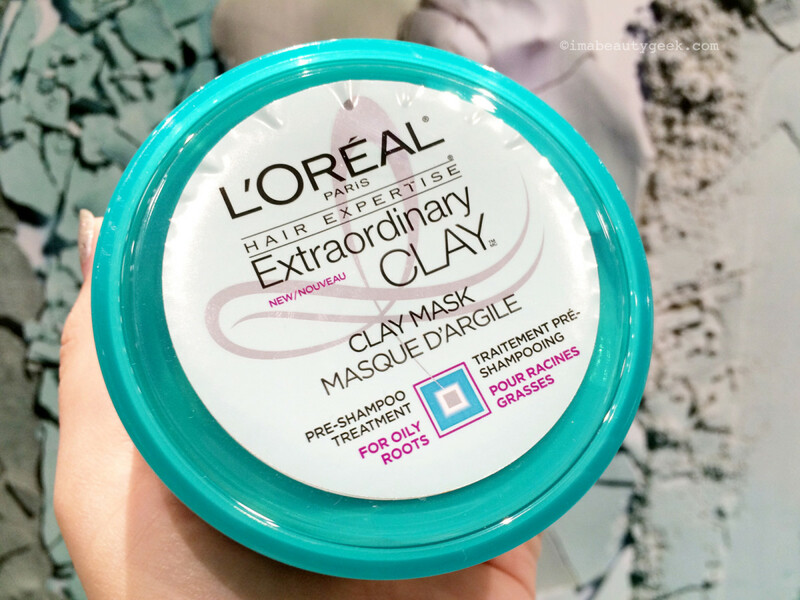 The L&apos;Oreal Paris Extraordinary Clay Clay Mask ($8.49 CAD at amazon.ca) pre-shampoo treatment for oily roots contains three types of clay – two will be familiar from this Clay vs Mud post from last week – kaolin, montmorillonite and argilane (listed in the ingredients as argilla). 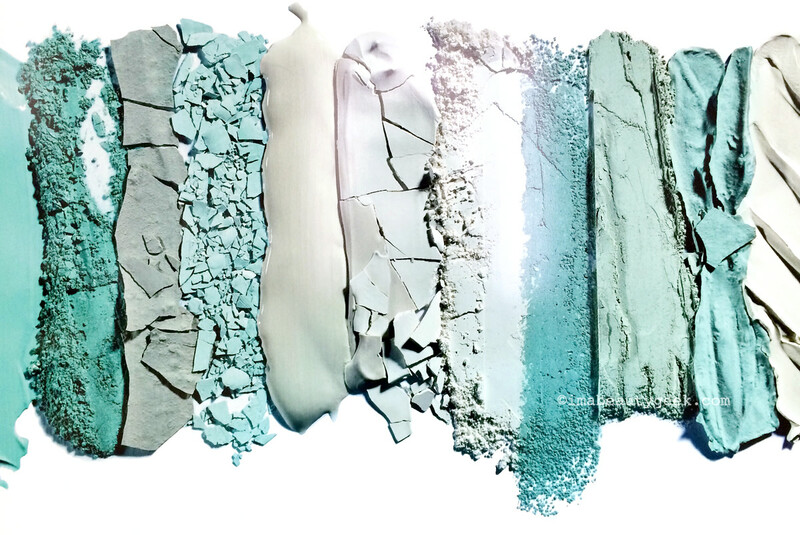 Kaolin, known for its absorbtion abilities, makes up the bulk of the formula. Argilane, aka argile or French green clay, is apparently more absorbent than kaolin; its pretty green colour comes from decomposed plant matter. Montmorillonite, aka bentonite clay, also has excellent absorption and detoxifying benefits, and swells up when moisture hits it. The Extraordinary Clay shampoo ($5.99 CAD at amazon.ca) and conditioner ($5.99 CAD at amazon.ca) contain all three clays as well and are designed to support the benefits of the clay mask. Obviously the media preview was set up to give us a chance to try the treatment, and I was totally in. The trio is designed for anyone who deals with extremely oily roots and dry ends; I have moderately oily roots with dry ends. Gotta say I loved the mask. It feels minty fresh (thanks, eucalyptus) on the scalp, and as Eric says in the video, its gellified texture makes it easy to apply to the roots. How to: Eric says to scoop out with fingertips, rake into hair at the roots and massage in, then fingercomb about an inch to two inches out into the hair. Post shampoo and conditioner, Eric blow dried my hair – and the brush moved easily through the strands without the need for styling serums. In fact, Eric told me the mask will have absorbed enough scalp sebum to give me an extra day or two out of my blowout, and he was right! Four days later, my hair still felt clean and swingy! 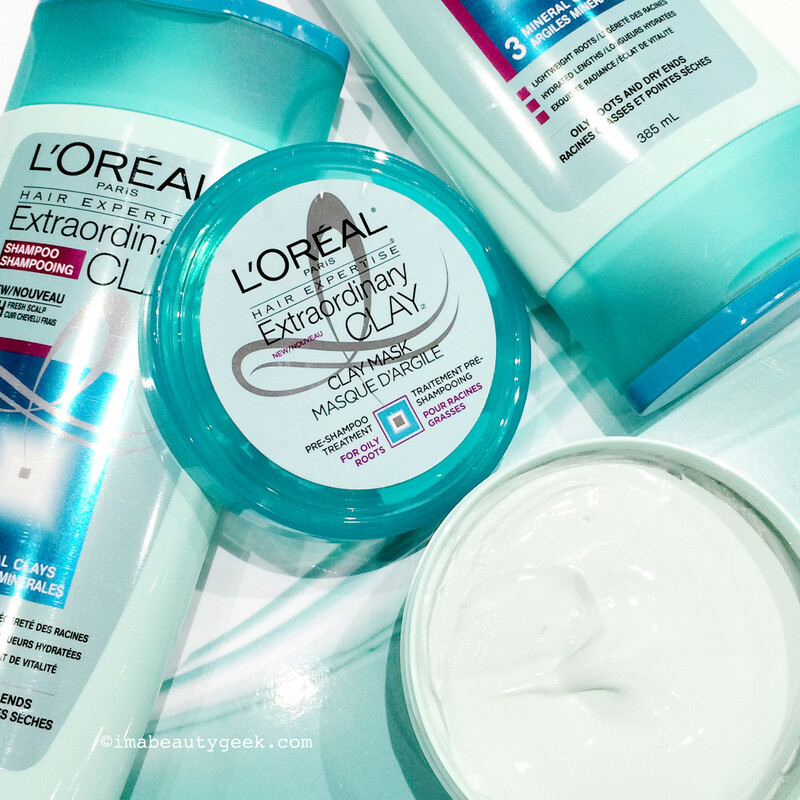 This L&apos;Oréal Paris Extraordinary Clay collection is also known as L&apos;Oreal Paris Elvive Extraordinary Clay – as with most L&apos;Oreal lines, it launched in Europe first. US friends, you can find the products under the European name on amazon.com. 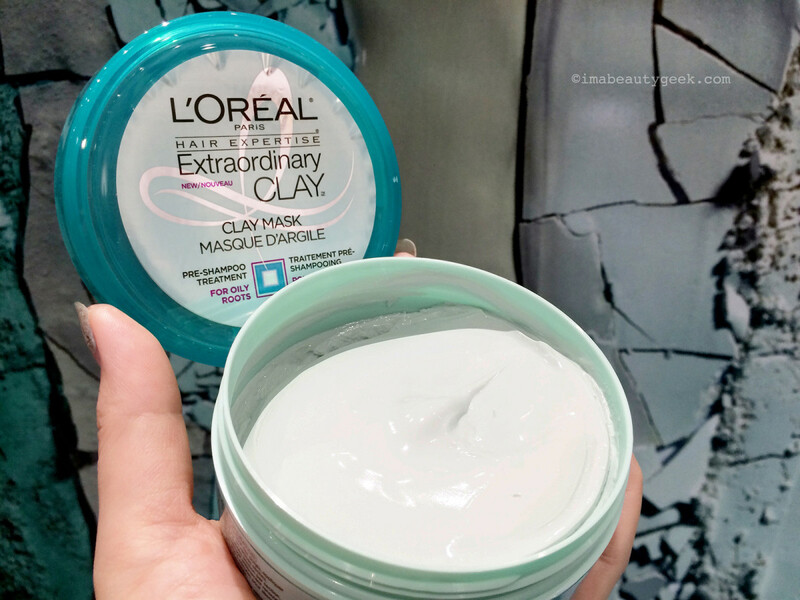 Extraordinary Clay landed in Canadian drugstores a couple of months ago. 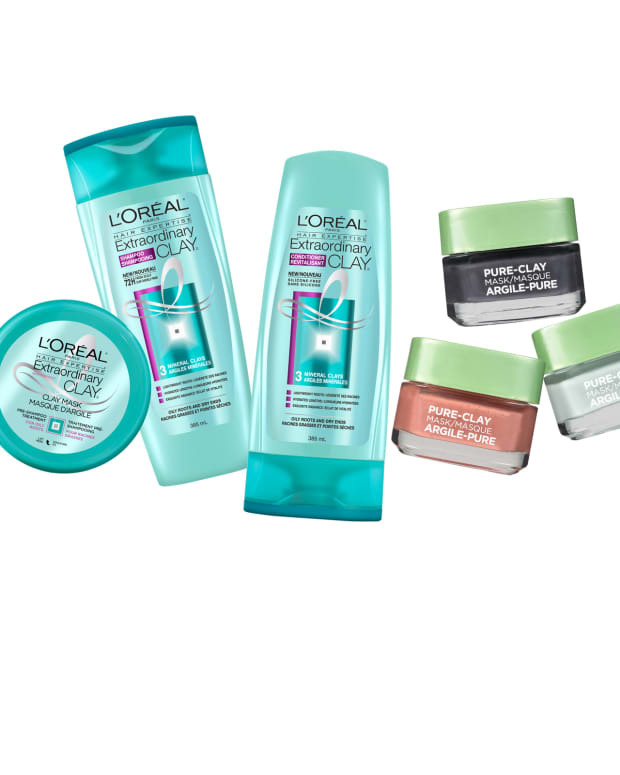 Find more L&apos;Oreal Paris Hair Expertise Extraordinary Clay info here. Have you tried this trio yet? Or any kind of clay hair mask at all? Tell me everything!